Looking to advance in your career as a nurse leader or educator? Regent's Master of Science in Nursing degree is designed for the adult learner with Registered Nurse licensure and a Bachelor of Science in Nursing. Develop the skills you need to bring about positive and impactful change to hospital systems and academic nursing programs. Choose from two concentrations: Nurse Educator or Nurse Leadership & Management—all presented from a Christian worldview. Gain the professional proficiency necessary to teach with confidence and engage with clients, colleagues and other stakeholders. Assess health systems and recommend evidence-based healthcare improvements. Apply ethical and responsible leadership behaviors to social, psychological and health-related situations. 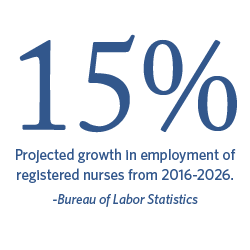 Expand career opportunities with the potential to advance as a nursing scholar. We are able to examine and view your unofficial transcript from a U.S.-based school, which indicates successful completion of a bachelor's degree program, in order to review you for an admissions decision. Please submit your unofficial transcript to our Admissions Office by email to transcripts@regent.edu using the subject line: MSN Master's Application Pieces. In order to be admitted to the MSN program, you must submit an unencumbered/unrestricted nursing license from your state of practice. The program may be completed in six or eight sessions or as warranted by the student. Completion of the program must occur within eight years of initial enrollment. Admission into the MSN program will be granted in the fall semester only. Should there be ample applicants, spring admission will be considered.